There is a place that lies between heaven and Earth, it is called The Realm. Within this place, the Guards of Peace, known as Garda Síochána, live and train to guide and protect the ones that walk the living arena until these people are called home. Just before Corey dies in a line-of-duty accident, she meets Officer Mitchell O’Reilly. Her feelings for him may change her destiny, but not for the better, as she falls in love with this married man. 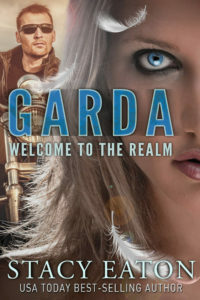 Brock, Corey’s Garda, will bring Corey home to The Realm and attempt to guide and train her for her future, even while she still fights for her past. Will Brock be able to direct Corey down the right path, or will she cross the line and fall from grace?